Ski Wildcat – the drive is worth the thrill on this north New Hampshire hill. Wildcat celebrated its 60th anniversary in 2018. Ask us about Wildcat NH White Mountain Ski Resort or share your NH ski area comments. Feature your business, contact us. A winter vacation to Wildcat Resort in the White Mountain region of New Hampshire offers skiing and snowboarding excitement. This established winter resort offers great ski trails for all skiers and boarders. 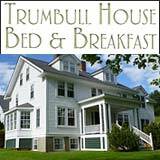 The Mount Washinigton Valley region of New Hampshire offers scenic mountain vistas, small towns and some historic grand hotels. 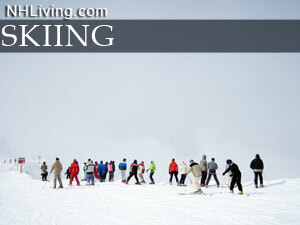 Snowboarding, skiing, and snowmobiling are popular winter activities. Share photos, read lodging reviews and compare rates and room availability. 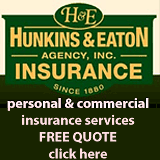 Find internet exclusive rates and vacation packages. 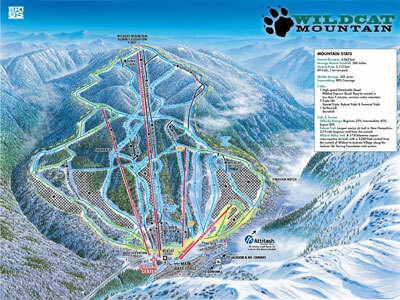 Wildcat Mountain in Jackson, NH features the Wildcat Express Quad and 3 triples. A full-service repair and tuning shop is located in the rental area. Alpine, telemark, & snowboard rentals are available. Wildcat Mountain also offers children’s programs and a nursery. A pub and restaurant are also available. The resort boasts 90% snowmaking coverage. The Summit Elevation is 4,062 feet. The Polecat ski trail is claimed to be the longest summit-to-base trail in New Hampshire at 2.75 miles in length. Getting There: From the south, take I-95 north to Spaulding Turnpike in Portsmouth, NH, then Route 16 north to Wildcat. 10 Minutes North Of The Village Of Jackson On Rt. 16, Between The Appalachian Mountain Club And The USDA Forest Service Androscoggin Ranger District. The original Wildcat Trail was a class-A ski race trail surveyed by Charley Proctor and cut by the CCC – the year was 1933. The trail was 60 feet wide, 1.5 miles long, and 2,000 vertical feet drop. In 1955 Mack Beal, Brooks Dodge, George Macomber, and Malcolm McLane started development of a lift-served ski area – the first of its type in the White Mountain National Forest and the first ever to be constructed on National Forest land on the East Coast. The Wildcat Gondola opened on January 25, 1958, making Wildcat Ski Area on of the largest commercial ski areas in the Northeast. In 1961 Route 16 was rebuilt and relocated across the Peabody River which allowed for a much larger base area for Wildcat. While major snowfall is not uncommon, the February 1969 winter storm dumped yards of snow – resulting in ten to 15-foot drifts and clogging the summer terminal of the gondola. Bulldozers were required to clear the lift lines.